Good quality guttering is essential. Heavy rain is not uncommon in the Brisbane area and your roof’s guttering must be well equipped to handle the conditions. If your guttering is leaky, rusty or overflowing, then you might need to replace it. Rather than searching endlessly online for keywords like, ‘Guttering Brisbane‘, ‘Brisbane Guttering‘ or ‘Roof Guttering Brisbane‘, just give the team at Strongguard a call, as we can help you with all your guttering needs. Strongguard can supply and install brand new gutters to an exceptional standard of quality with our gutter replacement service. We assess the features of your roof and take them into account when selecting your new guttering. Doing so allows us to provide the best possible guttering for your roof. This means that your guttering will be able to drain your roof effectively when the next heavy deluge arrives. Alternatively, if you only need some specific repair work, you might be better suited to our gutter repair service, so we can patch up your existing gutters and extend their lifespan. We have over twenty years of experience, so we’re familiar with guttering systems and how they work. This allows us to offer targeted roof guttering maintenance and installation for both domestic and commercial properties. Here at Strongguard, we recognise that good guttering consists of quality products and excellent installation. Having spent over twenty years in the industry, we have all the knowledge, experience and equipment necessary to install your new roof guttering. We work to the highest standards of quality and safety. Our Brisbane guttering process is targeted at meeting your needs specifically. Different roofs require different guttering solutions. This is something that we understand well, and we will ensure that your gutters function at their best. We will always choose the right profile and design of guttering to suit the application at hand. This means that your guttering will always drain your roof correctly – even in heavy rain. To ensure that you get the best quality products, we only source metal COLORBOND® steel guttering. COLORBOND® steel guttering is made by BlueScope steel, which is completely Australian owned. This means that you are getting Australian quality that is built to withstand our unique weather conditions. It is vital that your guttering matches the size and design of your roof. There are many different roof designs in Brisbane, which is why the team at Strongguard offer a wide range of guttering profiles. 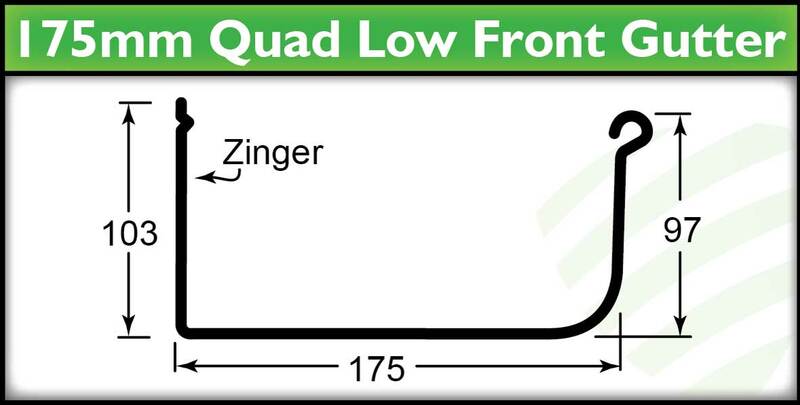 The 150mm Quad profile is a classic design. It is versatile and we can install it on new homes, or use it to replace old guttering. It is also suitable for both steel and tile roofs and compatible with timber or metal fascia. This makes it one of our most widely used guttering designs. The 150mm Quad profile comes with multiple bracket options, including external spikes, straps and internal concealed brackets. 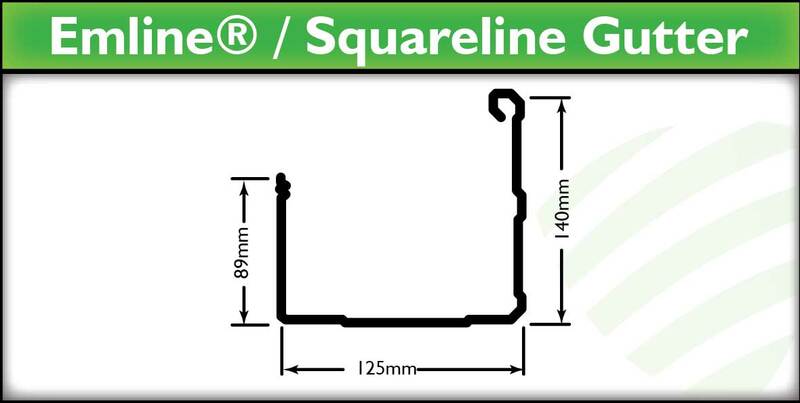 The Emline® or Squareline gutter is a more modern type of guttering profile. It is designed to offer a very large rainwater carrying capacity and a sleek appearance. To achieve its seamless looks, the Emline® guttering profile has concealed fixing. This means that it will add a modern design touch to your home. 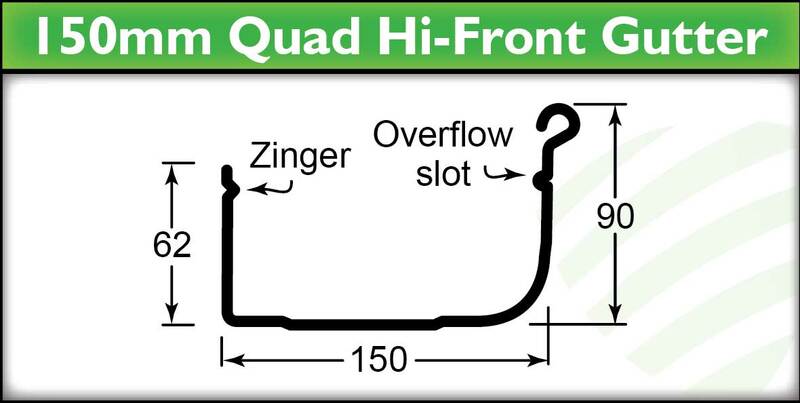 The 150mm Hi-Front Quad is a more modern take on the traditional Quad profile. It is compatible with both steel and tiles roofs, which makes it an ideal choice for pretty much any home. 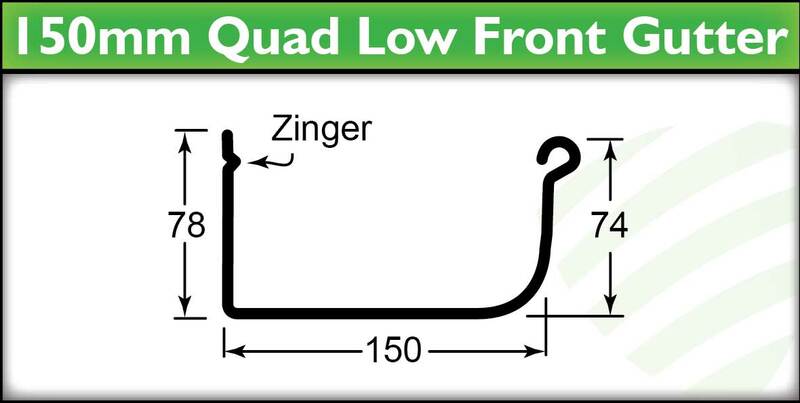 Just like the traditional Quad design, the Hi-Front Quad profile is compatible with both timber and metal fascia and has the same bracket options available. 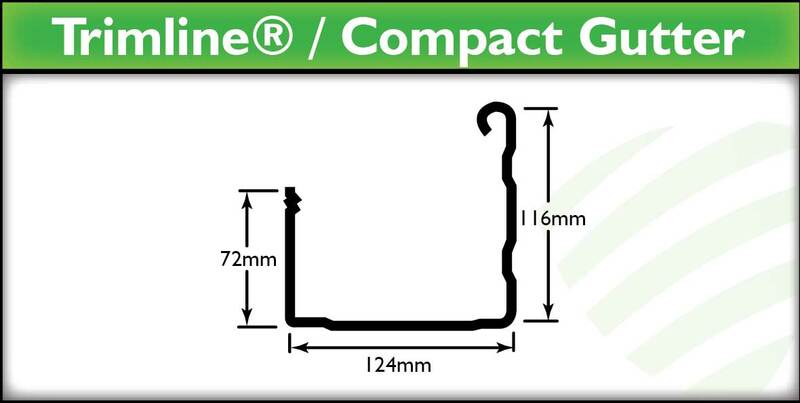 The Trimline® guttering profile is designed to be economical and easy to install. It is suitable for a variety of different roofing materials, including steel and tiled roofs. In addition to being fast and easy to install, the Trimline® profile is both durable and attractive. This makes it ideal for homes across Brisbane. The 175mm Quad guttering profile offers the largest volume of water carrying capacity. It is suitable for metal and timber fascia, so it is easily installed in most homes across Brisbane. Due to its high volume capacity, the 175mm Quad is suitable for homeowners who are looking to catch as much water as possible for rainwater tanks. If your guttering is beginning to rust out or overflow, then contact the team at Strongguard. Guttering solutions are our speciality and we carefully assess your roof to ensure that your new guttering is ideal. To contact us for a quote or more information, simple give our team a call. Alternatively, you can fill in an online enquiry and we will get back to you. #1 Do you use the same brackets or do you replace them? Here at Strongguard, we take pride in our installations. As a part of this, we do not cut any corners or take any shortcuts. This means that when you get new guttering from us, your gutters will be more than just restored – they will be improved. We will remove the old brackets from your roof when we remove the guttering. Once we have done this, we will install brand new brackets for your new guttering. This will ensure that the gutters drain correctly. When it comes to guttering, installation is everything. Even with the highest quality materials and components, it is vital that the installation is done correctly. Without thorough workmanship and installation, the guttering risks flooding or improper drainage. This can affect other parts of your home too. If water overflows from poorly installed gutters, it can cause damage to the inside and outside of your home. For this reason, the team at Strongguard are dedicated to installing your guttering to the highest quality, with brand new components all round. #2 Do you install Leafguard to limit blockages? Leaves are one of the main causes of blocked gutters and drains. During wild weather or heavy downpours, the leaves on your roof are all washed into your guttering. Without the right guttering, maintenance and precautions, this can very easily cause your guttering to overflow. Leafgaurd is a great solution for this. Essentially, Leafguard protects your gutter from becoming clogged and overflowing. 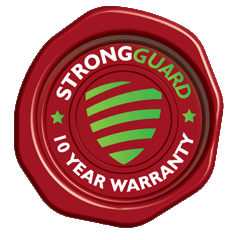 Here at Strongguard, we recognise the advantages that Leafguard offers most homeowners, so we can certainly install it for you. We have a variety of profiles that will suit your needs specifically. All roofs and gutters are different, which is why these different profiles are necessary. With a wide range of Leafguard options, you can rest assured that we have the solution for you. #3 Can you replace only the leaking or rusted part of my guttering? Here at Strongguard, we recognise that you might not necessarily need all your guttering replaced at once. Quite often, guttering will rust out in one particular spot. This is often a result of blockages, poor installation or just general deterioration. As well as this, falling branches and debris frequently damages guttering. While it is important to have this repaired, it doesn’t always mean that a complete replacement of your guttering is necessary. In these cases, the team at Strongguard can simply replace damaged part for you. However, it is important to be aware that rust is often a symptom of an underlying issue with your guttering. Specifically, rust occurs when the fall of your gutter is suboptimal. In some cases, we might suggest replacing your whole gutter. #4 Can you also paint my fascia? The fascia of your house is the long straight board that runs alongside the lower edge of your roof. It serves to carry the load of the bottom row of tiles, if you have a tiled roof. As well as this, it carries your guttering. At Strongguard, we believe that all guttering solutions should be both practical and good-looking. To help maintain a consistent and visually appealing aesthetic in your home, we can paint your fascia to match the new guttering. This will give you the benefits of a brand new guttering system and a freshly painted fascia. These benefits combined offer your home a bit of a facelift as well as great drainage. #5 Will you need to set up scaffolding? Here at Strongguard, safety is our foremost priority when working on any roof job. It is a legal requirement, under workplace health and safety regulations, that we set up the correct scaffolding and guard rails when working. To do this, we use a combination of trestles, planks, scaffolding and elevated work platforms. This allows us to have full access to your guttering, while maintaining our safety. We like to ensure that you don’t have to worry about any hidden costs, which is why we include the price of scaffolding and safety gear in our initial quote.